The OES 11g Authorization filter is used to delegate the authorization decision to OES. This filter assumes that an authentication filter has been configured prior to it. Therefore, by the time the authorization filter executes, the authentication.subject.id message attribute is populated and its value is used as the subject in the authorization request to OES. The following diagram shows the sequence of events that occurs when a client sends a message to API Gateway. The request sender is authenticated by API Gateway and is then authorized against Oracle Entitlements Server. If the user is permitted to access the requested resource, the request is routed to the Enterprise Application. Otherwise an appropriate fault message is returned to the client. This integration is also valid for the API Gateway Appliance (physical or virtual) version 7.6.2 or higher. You must create an OES user called weblogic. Refer to the OES documentation for instructions on how to add a user. You must have added the weblogic user to the API Gateway local user store. The policy you will set up later requires an authenticated user's request to be authorized against OES. By adding the weblogic user to the local user store, the client can authenticate as this user. The user name will then be stored in the authentication.subject.id message attribute, which is then passed to the OES 11g Authorization filter and subsequently on to OES to make the authorization decision. See the API Gateway Administrator Guide for more information on adding users. 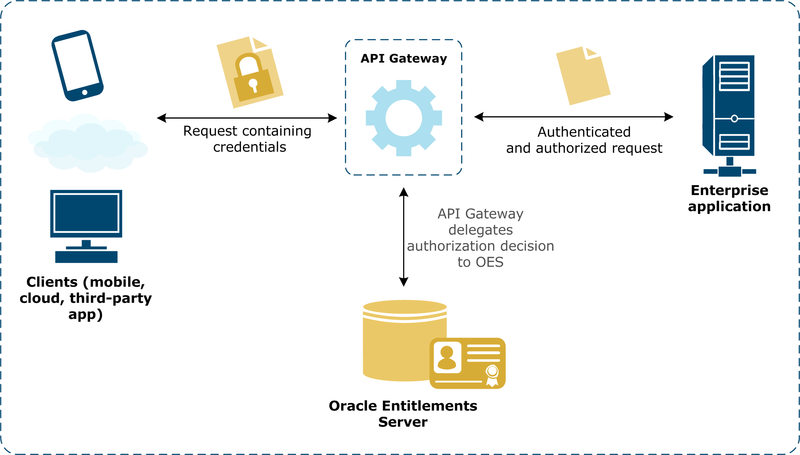 You must have installed the OES client (security module) on the machine running API Gateway. The OES client has its own installer, which is available from www.oracle.com. Note In the following integration steps, this version of the OES client was used: Oracle Entitlements Server Security Module 11g - 11.1.2.0.0. The OES client installer requires that a JRE is available on the target machine. In the absence of a preferred JVM on the target machine, API Gateway ships with a JRE that can be used. On UNIX, the JRE is located in INSTALL_DIR/apigateway/platform/jre. Note This command assumes a WebLogic domain of oes_domain has already been configured.